The gold standard ‘Identification’ tool is the AUDIT (Alcohol Use Disorders Identification Test). However many shorter versions of the AUDIT allow a shorter initial screen. These shorter tools, although less accurate, save time by not asking further questions for those likely to be lower risk drinkers and therefore not likely to need a brief intervention/Brief Advice. AUDIT-C: A score of 5 or more indicates increasing or higher risk drinking, so should be followed with the remaining 7 AUDIT questions to identify level of risk or potential dependence (i.e 10 questions totalled). FAST: Found to be the most accurate shorter screening tool, this 4 item questionnaire is commonly used in Primary Care. A score or 3 or more should be followed with the remaining 6 AUDIT questions to identify level or risk or potential dependence (i.e 10 questions totalled). 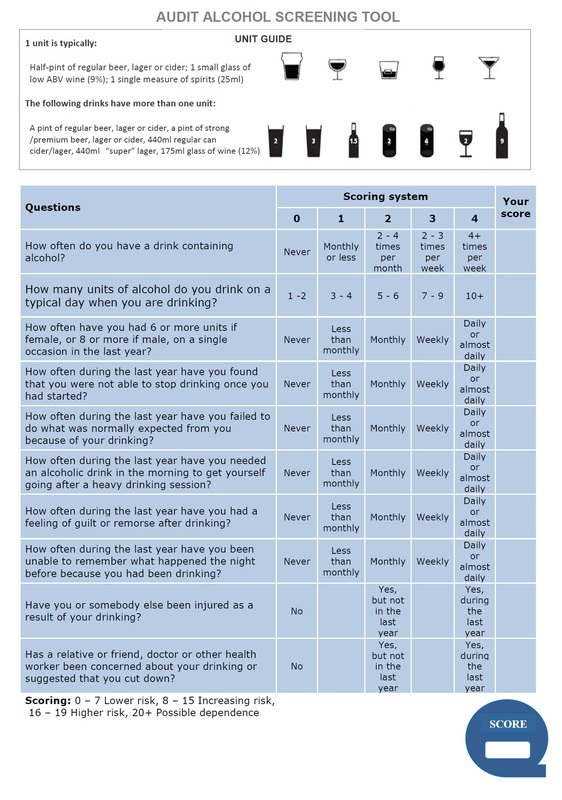 M-SASQ: This is the 1 question ‘Modified Single Alcohol Screening Questionnaire, which has proven useful for very busy settings such as Emergency Departments. A score of two or more on the M-SASQ should be followed up with the remaining 9 AUDIT questions. 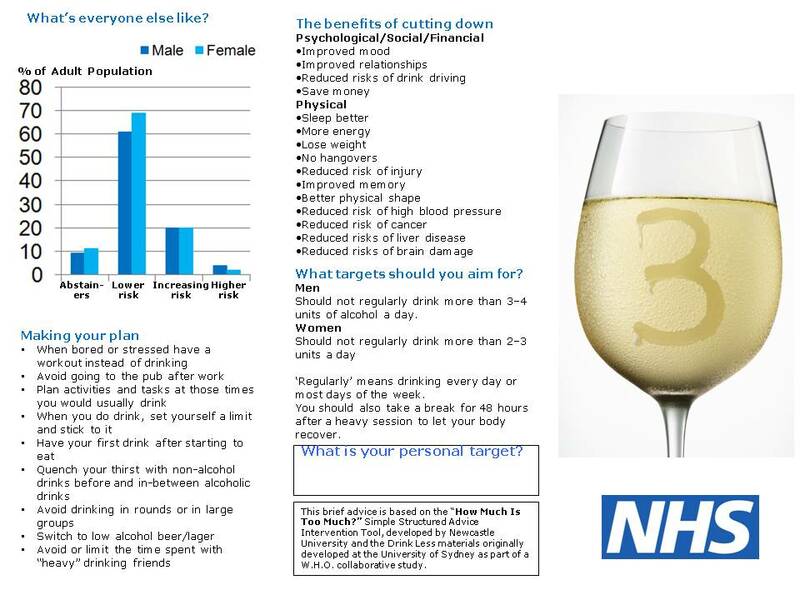 Some further screening tools are available here on the Alcohol Learning Centre. As described under About IBA, practitioners must be careful not to ‘advise’ too much, rather than encourage at-risk drinkers to think of their own reasons or ways of cutting down. However a useful 2-sided Brief_Advice_Tool is available (PDF version) and youth version here. It includes the key elements of ‘Brief Advice’ and includes useful pointers for the practitioner to show the client. Although not designed specifically to be given to the client, it may be useful to do so if other resources are not available, such as those below. Other options may also be considered, such as ‘Your Drinking and You’, which offers a six-step plan to cutting down. It is important to be able to offer information on accessing local treatment services, or at least the Drinkline number 0800 917 8282 which can help. Brief intervention comes in a variety of shapes and sizes, with research still unclear on what forms may be most suitable when. In England, most IBA delivery has been modelled around a simple brief intervention, including at least screening, simple brief advice and leaflet. However ‘lite’ versions have seemed increasingly popular, as explored in the 2013 Clarifying Brief Interventions paper. A set of ‘National Standards’ for drug and alcohol works are known as ‘DANOS’, which outline the skills needed for IBA as AH10 Employ techniques to help individuals to adopt sensible drinking behaviour.